While the beaches of Copacabana and Ipanema offer a lot to see and there is always something going on, sometimes visitors find themselves in need of a break from the vibrant city of Rio de Janeiro. Grumari Beach is one of those beaches that is still a real insider tip and since it can only be reached by car, it is not very well known by tourists. Here, you can enjoy peace and tranquility surrounded by rolling hills and deep green Atlantic rainforest. The powdery sand along the 3 kilometer long beach is a bit darker, which, combined with the wild landscape, creates a stunning backdrop for this day trip. Just like the adjoining Prainha Beach, Grumari Beach is part of a nature reserve and still very off the beaten track. Accordingly, visitors are predominantly locals and the signs of mass tourism have not yet manifested. The bay is very clean and pristine and can often be found completely deserted during the week. Due to its status as an environmentally protected area, there are no people living in the immediate area, but the village of Guaratiba is located fairly close by. The locals there live mainly from fishing and accordingly, some of the best seafood restaurants in Rio can be found there. Grumari Beach can be found about half an hour west of Rio’s city center. Busses only go as far as Prainha Beach and consequently, Grumari Beach is best reached by car. It is easiest to either rent a car for the day or arrange for a taxi to take you there and back. There are no facilities and amenities and it’s advised to bring plenty of food and drink. 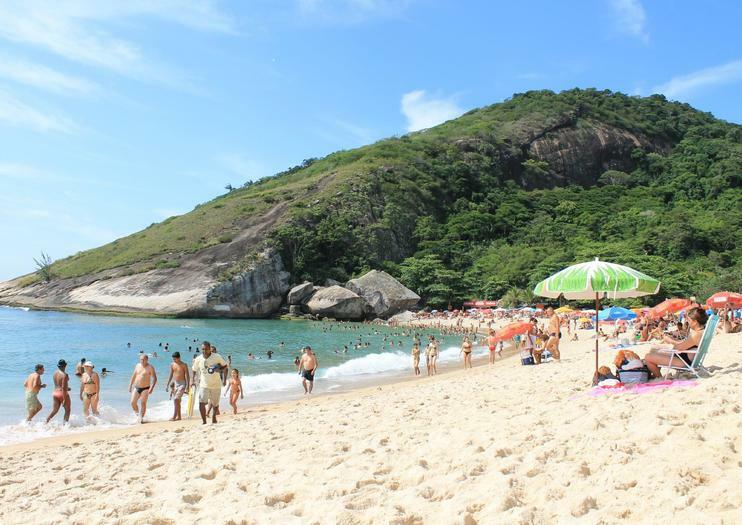 Tour the 25 miles (40 km) of pristine beaches on Rio's southern coastline with a private guide. During this 4-hour private tour from the city of Rio with up to 4 people, drive through the Tijuca National Forest to reach the stretch of unspoiled beaches south of the city. Spend time with your toes in the sand and the tropical sun on your back. Swim in the turquoise waters and relax on beaches like the isolated Prainha Beach, which is known for surfing. Enjoy the flexibility and customization that comes with a private tour. Summon your courage for a 3-hour private rappelling tour at Turtle Stone from Rio de Janeiro. With your expert adventure guide, spend time rappelling and trekking in this less-visited area which features unspoiled beaches and sheer cliffs. Admire the wild greenery and listen to the waves crashing on the beaches below as you rappel 144 feet (44 meters) over beachside cliffs. All equipment, entrance fees and activities are included. Visit the outskirts of Rio and its lush beaches following the seafront. Observe the Olympic Park and the City of Arts, visit the Museum of Popular Art, watch the landscapes of mangrove and the lagoons area known as Pantanal Carioca. Join small groups, avoid wasting time due to large ones, and visit the surroundings of Rio de Janeiro. Observe the City of Arts Hall, the Olympic Park, where the famous Rock in Rio festival is held. Follow seafront through the beaches of Barra da Tijuca, Recreio dos Bandeirantes, Grumari and several exuberant beaches. Get to know the beach for surfers and its reserved area for nudism. From the Point Grumari, observe the mangrove área close to Rio de Janeiro, and the area known as “Pantanal Carioca” between four lagoons. Visit the Museum of Popular Art to understand Brasil through its popular manifestations. Barra da Tijuca lies between the almost 20 km of beach and the two massifs that contemplate the forest of Pedra Branca and the forest of Tijuca. Tour the 25 miles (40 km) of pristine beaches on Rio's southern coastline with a private guide. During this private tour from the city of Rio with up to 4 people, drive through the Tijuca National Forest to reach the stretch of unspoiled beaches south of the city. Spend time with your toes in the sand and the tropical sun on your back. Swim in the turquoise waters and relax during this break from the frenetic pace of the city. Enjoy the flexibility and customization that comes with booking a private tour.